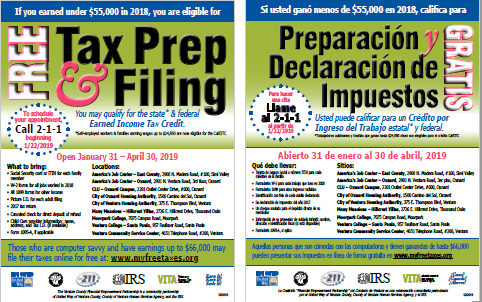 Free Tax Preparation and Filing is available at 9 locations throughout Ventura County, to qualified households*, in both English and Spanish. Most households earning approximately $55,000 or less in 2018 qualify to file their taxes. Tax returns are prepared and filed by trained volunteer tax preparers. Call 2-1-1 to see if you qualify and make an appointment at a site near you. If your household earned $66,000 or less in 2018, you may be eligible to file your taxes online. *A household includes all individuals listed on your tax return. or schedule online at www.myfreetaxes.org. See the flyer for a list of sites and what you need to bring to your tax preparation appointment. To schedule your appointment, call 2-1-1 or visit www.myfreetaxes.org. The Earn It! Keep It! Save It! 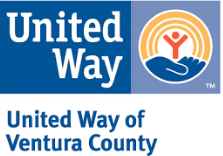 Volunteer Income Tax Assistance (VITA) program is a community partnership of United Way of Ventura County, County of Ventura Human Services Agency, and the IRS to provide preparation and electronic filing of federal and state tax returns free of charge for low and moderate income earners. Last year, the program brought back $2.5 million in tax refunds to Ventura County families, including $1,071,204 dollars in Federal Earned Income Tax Credits! 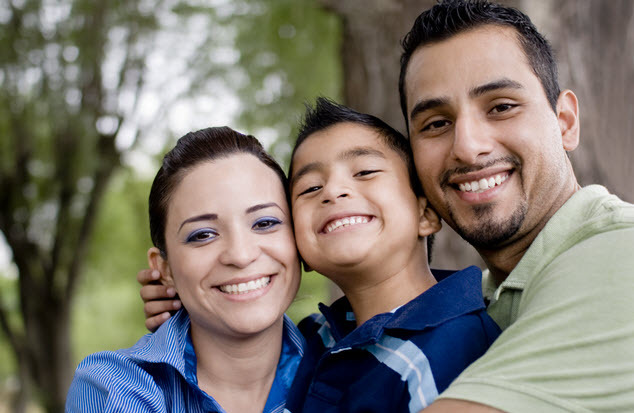 The Earned Income Tax Credit (EITC) is a tax credit for low- to moderate-income working families and individuals. The EITC can help you reduce your tax liability and, in many cases, put money in your pocket. To qualify for the EITC, you must have worked during at least part of the previous year, meet certain income requirements, and file your taxes. You must file your taxes to receive the EITC, even if you did not earn enough money to be required to file. The EITC benefit is retroactive for three years, so review whether you filed for the EITC in recent years. If you meet the eligibility requirements and have not filed for the previous three years you may be entitled to an even larger refund check! The following income guidelines for the 2018 Tax Year will help you determine if you may be eligible for CalEITC. The threshold is based on tax year 2018 EITC AGI (Adjusted Gross Income) limits. In addition to the Federal Earned Income Tax Credit you may be eligible for CalEITC, an additional statewide Earned Income Tax Credit for low-income households. Call 2-1-1 to schedule an appointment or file online. Will this Affect my Government Benefits? Participation in free tax preparation or any other additional services will not impact CalWORKS, CalFRESH, or Medi-Cal benefits.